The figure of Santa Claus is based on a fourth-century saint, the original St. Nicholas. Editor’s note: Adam C. English is author of "The Saint Who Would Be Santa Claus: The True Life and Trials of St. Nicholas of Myra" (Baylor University Press, 2012) and associate professor of religion at Campbell University. Four years ago, I embarked on a quest to discover the truth about Santa Claus and the original St. Nicholas. My search took me many places, sending me finally across the Atlantic to Bari, on Italy’s Adriatic coast. The old town of Bari is a brambly, medieval maze of streets and alleyways that cross and crisscross. It is said that the city was intentionally constructed in a topsy-turvy way so that anyone trying to raid it would get swallowed and lost in its labyrinth. If you keep wandering, though, eventually you pop out onto a plaza and see the Basilica di San Nicola. And there, in a gray tomb, lies the “real” Santa Claus. The basilica housing that tomb dates to the 11th century. You can go into the basilica and pray, rest or just gawk, but the real show lies below. Down dark steps you will enter a candle-lit crypt, built in 1089, supported by 26 marble columns. Through a grate you will see a large marble and concrete tomb, St Nicholas’ final resting place. Little is known for certain about the life of Nicholas, whose name means “the people’s champion.” He was born sometime after the year 260 and died sometime after 333. He was bishop of the church in Myra in what was then the Roman province of Lycia, Asia Minor. He attended the Council of Nicaea in 325 with the other bishops of the Christian empire, where he would have seen the Emperor Constantine. Perhaps he would have slipped into obscurity as nothing more than a minor saint - originally he was a patron saint of sailors - except for one unique story that circulated about him shortly after his death. It’s such a strange and surprising tale that historians assume it must be based to a large degree on fact. It is the tale of three poor daughters. Nicholas had been aware of a certain citizen of Patara - in Lycia, modern-day Turkey - who had once been an important and wealthy man of the city but who had fallen on hard times and into extreme poverty. The man grew so desperate that he lacked the very essentials of life. The poor man reasoned that it was impossible to marry off his three beautiful daughters because they lacked dowries for proper marriages to respectable noblemen. He feared they would each in turn be forced into prostitution to support themselves. Nicholas heard this heartbreaking news and resolved to do something about it. He bagged a sum of gold and in the dead of night, tossed it through the man’s window. The money was used as a dowry for the first daughter. Sometime later, Nicholas made a second nighttime visit so that the second daughter might marry. Later tradition reported that, finding the windows closed, he dropped the bag of gold down the chimney, where it landed into one of the girl’s stockings that was hanging to dry. When Nicholas returned to deliver anonymously the third bag of gold for the last daughter, the curious father was ready. When he heard a bag hit the floor, the father leapt to his feet and raced outside, where he caught the mysterious benefactor. Nicholas revealed his identity to the father but made him swear never to tell anyone what he’d done. He did not want praise or recognition for his generosity. 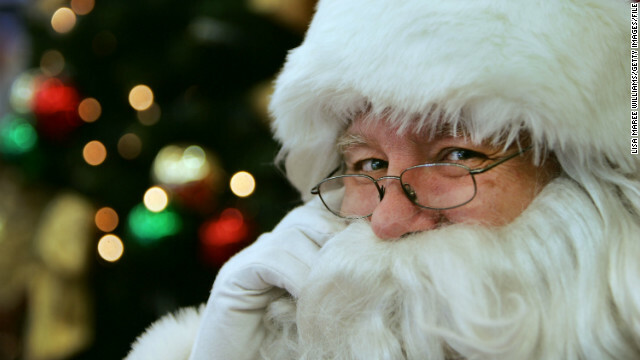 More impressive than its connection with modern-day Santa Claus traditions is the tale’s historical uniqueness. The vast majority of saint stories that circulated in the early church involved extraordinary miracles and healings or dramatic martyrdoms and confessions of Christ. They involved monks who went into the desert and experienced the tempting of the devil and the burning of the sun, mothers who’d had their entrails spilled onto the Colosseum floor for Christ, mystics who saw the heavens open in their visions. But the Nicholas story was about a regular family facing a familiar crisis to which ordinary people could relate. Those in the pews had never heard anything like it. When medieval Christians looked at the great church frescoes, basilica mosaics and cathedral stained glass pictures of Jesus, Mary, John the Baptist, the apostles and saints of old, there was little to distinguish one saint from another. But St. Nicholas was easy to spot. He was always pictured carrying three bags of gold. The story of his helping the three sisters jumped off the dry page of history and into the minds and imaginations of young girls and boys and adults. Indeed, Nicholas would become the most popular nonbiblical saint in the pre-modern church. More churches would be dedicated to him than to any other person except Mary, the mother of Jesus. The first medieval drama that was not intended as a worship ritual and that was written in the vernacular was about Nicholas. No wonder, then, that sailors from Bari wanted his bones. In the 1080s, Seljuk Turks invaded Lycia and Asia Minor (what is now Turkey). It seemed only a matter of time before they would plunder the tomb of St. Nicholas. The Barians resolved that his bones be moved, or “translated,” to use the expression of the day. Under the nose of the Turkish overlords in control of the area 47 Barian sailors disembarked at Myra disguised as pilgrims. They quietly made their way to the church of St. Nicholas, hiding swords and shovels under their clothes. As soon as they entered the church, they barred the doors, smashed the marble cover and looked inside. They found more than they had bargained for: Nicholas’ bones were floating in a sweet-smelling liquid like oil or water. Known as the myrrh or manna of St. Nicholas, the liquid was highly valued for its purported miraculous and therapeutic qualities. The bones were taken back to Italy and a basilica was erected in Bari to house them. To this day, Nicholas’ tomb continues to excrete a small amount of watery liquid. Every year on May 9, one of the Dominican friars charged with the upkeep and care of the Basilica di San Nicola squats down in front of a small opening in the tomb and slowly collects a vile of the myrrh of St. Nicholas. It is then diluted in holy water and bottled for pilgrims and visitors. So there is a lot more to the story of St. Nick than meets the eye. His bold initiative to help three poor girls in need sparked a tradition of gift-giving that has carried into modern times. The magical Christmas Eve visits from Santa Claus represent the vestige of this old story. Instead of fixating on the commercialization and greed that plague the modern Santa Claus, I chose to see in it the lasting power of a simple act of kindness. More than a footnote to the legend of Santa Claus, Nicholas is a model of Christian kindness, an inspiration for charity and a saint to be remembered. He challenges us at this time of year to give not only to those we know and love, but also to those we do not know and especially to those who find themselves in need. The opinions expressed in this commentary are solely those of Adam C. English. Reblogged this on Rosemary Blog. People should not wait for christmas, to be loving and giving. How the Christians eventually stopped the Roman persecution they suffered and this included Saint Nicholas who was jailed for awhile, was there were so many Christians willing to die instead of renouncing Jesus and they prayed for their executioners as they were walking to their death, the Romans eventually realized nothing fake or superficial can lead men do this. Dear Atheist, If you are trying to change the mind of someone who has encounterred the risen Christ, you might just as well push a rope. When you know, you know, and many have died before ever denying Him. Someone in this world dies every day for being a Christian, including today. Someone dies everyday, by mere virtue of being alive in the first place. And many believers have become atheists, simply by realizing that there is no rational reason to believe in any god.